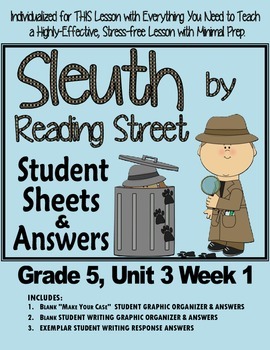 This lesson plan goes with the Sleuth magazine component of the new reading series, Reading Street, by Pearson. The article referenced is not included in this download. 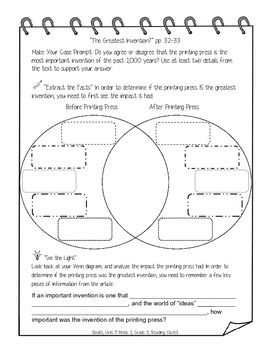 Included are Graphic Organizers/answers for Sleuth Article "The Greatest Invention?" NOTE: There are 2 prompt for this article. 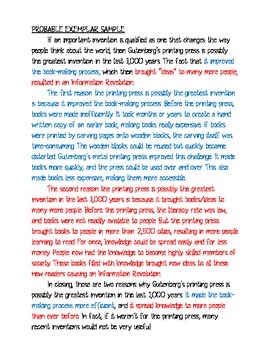 The original prompt (which requires minimal text evidence) and one I added that requires text evidence from this article. One of my Buyers called this download a Teacher’s Manual for Sleuth, which I thought was a perfect description! The Sleuth magazine included in the new Reading Street reading series by Pearson does not really come with any support other than the articles and questions. I was floored when I saw this and instantly knew it could/would be a nightmare for teachers to implement correctly. These critical thinking “Make Your Case” questions require so much of students (and teachers) that many teachers find themselves spinning their wheels, not even knowing where to begin. With this download, you’ll get everything you need to feel confident knowing you are correctly and strategically teaching students how to “get” analytical writing (Sleuth) using specific graphic organizers and highly-effective lessons plans. In this download you get the 3 missing components for the "Make Your Case" analytical writing component for Sleuth. 3. An answer key for the teacher. These components are needed because, we can’t just ask students higher level questions, we have to teach them how to think through them in order to arrive at the answer. I have 20 years of writing training and elementary teaching under my belt. I have spent hundreds of hours perfecting these lessons so that you don’t have to. Reading over my lesson plan, answer sheets, and exemplar response will let you know ahead of time the direction to lead your students for each particular article. And, there's really no second guessing yourself during the lesson as the sheets have all the answers you'll need. It is my hope that this relieves some of the stress and pressure that teachers without this resource may be feeling. You are after all, trying to teach college-level writing to elementary students! I have felt from the start, and still stand by it, that what Sleuth requires of our students is beyond what their little minds are capable of. Without additional support, many of our students are left asking, “Huh?” Help has arrived. Sleuth has the potential to expose your students to some of the most challenging and cognitively complex tasks they’ve ever faced in elementary school. That being said, the first few lessons are not easy. This is all new to your students. But, it will get easier as the students (and teacher) are exposed to these difficult tasks. After having done this with my own class since the beginning of the year, I can now say my students are becoming more and more independent. It will all depend on how much time you put into writing and your group of students. Do this weekly, and your students will never look and think about words on a page the same. Keep these resources a secret if you want to blow everyone’s test scores away, or let your colleagues know about these on TpT and make friends forever. 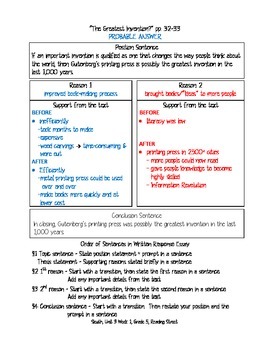 The graphic organizers and answer key included in this download are individualized for THIS PARTICULAR ARTICLE. This download will help you get the most out of every minute you spend teaching Sleuth, help your lessons flow smoothly, and give your students the solid background they need to become experts in analytical/argumentative writing at the elementary level.